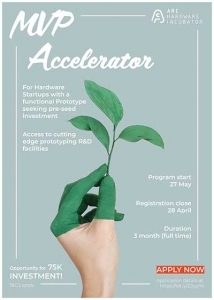 Arc is a new kind of innovation space designed to help startups streamline the development and commercialisation of their innovative hardware products. Arc achieves this by providing efficient and affordable access to cutting-edge advanced prototyping and manufacturing equipment, technical know-how and industry mentorship. Affordable access is achieved by implementing a subscription-based model and by ensuring that the available equipment is used efficiently and on a continuous basis.